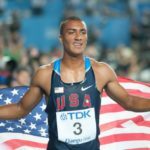 Ashton Eaton is a retired American decathlete and two-time Olympic champion, who holds the world record in both the decathlon and indoor heptathlon events, and is the second decathlete to break the 9,000-point barrier, with 9,039 points. On August 29, 2015, he beat his own world record with a score of 9,045 points. "When I see my mom in the stands, it always pushes me to succeed."